Cleansing your blood is a great way to naturally rid toxins from your body and keep yourself in good health. The health of your blood is closely connected with your body’s immune system and ability to fight infections. Blood provides your body’s cells with oxygen and nutrition and removes waste and other unnecessary pollutants. Therefore, purifying your blood is important to keep your body functioning properly and help prevent infections and diseases. Generally, keeping your liver and kidneys in good health are the best ways to cleanse your blood naturally. Your liver and kidneys perform vital functions in filtering toxins from the blood and keeping your blood clean. However, your intestines, lungs, and skin are also involved in eliminating waste products from your blood so it’s important to keep them healthy to help building a stronger, healthier blood. There are many factors which can cause a buildup of toxins in our bloodstream. For example, being exposed to more pollutants in the air, having a sedentary lifestyle, eating processed foods, taking certain medications, and using certain cosmetics and household products can all influence the health of your blood. You can help remove and flush out toxins from your blood by eating the right kind of foods and herbs. 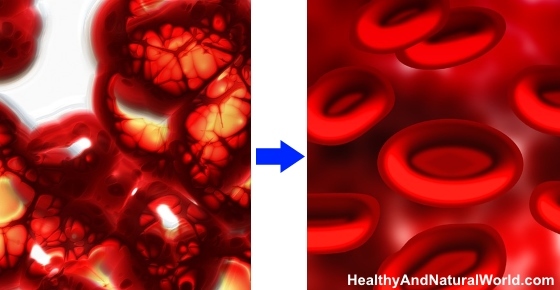 In this article, I will look at the importance of detoxifying and purifying your blood. You will also learn which are the best foods and herbs to cleanse your blood naturally and help to build stronger and healthier blood. So, keeping your blood clean and healthy is important to enjoy good health and helps to prevent some diseases developing. Purifying the blood naturally through the body’s own cleansing system helps you fight bacterial, viral, and fungal infections more effectively. The two main organs involved in cleansing toxins and pollutants from the blood are the liver and kidneys. There are many foods and herbs that help your liver and kidneys to function better so that they filter out toxins and keep your blood clean. Some natural remedies also include ingredients that have antibacterial and antiviral properties that assist in keeping blood healthy. Raw garlic is a great natural remedy to cleanse your blood because it contains sulfur that helps to get rid of toxins. Garlic also acts as a powerful antimicrobial agent to help with blood purification and keep your intestines free from bacteria, parasites, and viruses. It is very easy to use garlic as a natural medicine by incorporating more garlic in your diet. In fact, you may be surprised to learn how easy it is to grow garlic at home. Eating more garlic can not only help to cleanse your blood but also help protect you from cancer, boost your heart health, and help manage diabetes naturally. Allicin is one of the sulfur-containing compounds found in garlic and it gets activated when raw garlic is chewed, chopped or crushed. Allowing the crushed garlic to stand for 10 minutes before consuming it enhances the formation of allicin (find out more tips in my article on how to avoid these 6 common mistakes when using garlic as an antibiotic). Consuming more garlic is also one of the 70 habits featured in my eBook 70 Powerful Habits For A Great Health which will guide you how to take positive steps to improve your wellness and overall health. Green leafy vegetables are another great food to help get rid of toxins from your body naturally. Vegetables like broccoli, cabbage, kale, and Brussels sprouts contain compounds that help to detoxify your body naturally and can assist in preventing diseases like cancer, cardiovascular disease, and diabetes. Cilantro (or coriander) is a leafy green that helps your body to get rid of mercury and other heavy metals that end up in your bloodstream via the food you eat or the polluted air you breathe in. This is one of the ingredients of my heavy metal detox smoothie. Leafy greens contain chlorophyll, a natural ingredient that helps to detoxify your body and build stronger and healthier blood. Chlorophyll helps to detox your blood by connecting with the toxins and free radicals and turning them into neutral materials. Apart from using green leafy vegetables to detox your body, they can also help to boost iron levels in your blood naturally. Dandelion extracts contain antioxidants that are commonly used to cleanse and detoxify the blood. Dandelion is also a rich source of vitamins A, B, C, and K which are essential for healthy blood. And indeed dandelion is one of the best herbs to naturally cleanse your liver, as well as cleanse your kidneys. Another natural plant that has blood-cleansing properties is burdock. Burdock has been used as a blood cleansing herb for centuries in Traditional Chinese Medicine (TCM) to promote blood circulation and detoxify the blood. Researchers from the University of Maryland say that blood purifying is one of the traditional uses of burdock. It helps to rid the bloodstream of toxins by increasing urine output. Red clover is another popular medicinal herb that has blood-purifying properties and can help to cleanse your blood. Red clover contains many vitamins and nutrients that can help to keep your blood healthy and reduce a buildup of waste products. To find out how to use red clover to cleanse your blood, please see my articles on how to prepare red clover healing tea and herbal infusions that cleanse your body. There are many ways to use raw unprocessed apple cider vinegar to boost your health, and keeping your blood clean is just one way. Raw apple cider vinegar contains natural antiseptic compounds that can help to kill off infections. Although ACV has acidic nature, once it metabolizes in the body it actually helps to keep your body more alkaline and naturally balance your pH levels. To use apple cider vinegar to help keep your liver free from toxins, many suggest consuming 1 to 2 tablespoons ACV in a glass of water each day. You can also try out one of my great apple cider vinegar detox drinks to help you cleanse your entire body and build stronger, cleaner blood. Beets contain active cleansing agents that help to improve your liver health and detox your blood. Beets can help you naturally increase your nutrient and vitamin intake and also provide many health benefits. For example, consuming more beets can help to lower blood pressure, lower cholesterol, and prevent heart disease. Beets can also boost your immune system by purifying your blood. You can also use beets to cleanse your lymphatic system and boost your health all year long. Broccoli is a cruciferous vegetable that has great detox properties for the blood. However, broccoli sprouts are even better for cleansing toxins from your bloodstream. Broccoli sprouts are a rich source of detoxifying compounds that can help to keep your liver and kidneys in good working order. Turmeric is a delicious golden spice that has amazing detoxifying properties. Adding turmeric to your diet is one way to help purify your blood and at the same time, spice up your meals. The blood-cleansing properties of turmeric are due to the compound curcumin. There are various ways to increase your intake of turmeric in your diet. For example, you can try out one of my great detoxifying turmeric smoothies. This includes adding black pepper to the recipe to increase the bioavailability of turmeric. Or, you can make an anti-inflammatory turmeric tea. Cayenne pepper is another great spice that you can use if you are looking for ways to clean up your blood. Cayenne pepper contains capsaicin which has many blood purification properties than can help to rid the body of toxins. Capsaicin is the compound that gives cayenne pepper and chilies their spicy kick. The journal Molecular and Cellular Biochemistry found that capsaicin has the potential to destroy some carcinogens. In clinical trials, capsaicin effectively detoxified cancer cells in lung cancer.18 Although more research has to be done, other studies have shown the effect of capsaicin in killing off cancer cells. Parsley is a blood cleansing herb with diuretic properties to help flush waste products from the body quicker. Parsley contains compounds that help to eliminate toxins and reduce the effect of poisoning caused by heavy metals. Parsley also has a protective effect on the liver, making it function more effectively. Blueberries are packed full of antioxidants which can help to clean the blood in the body. Blueberries can make delicious smoothies that help to reduce the risk of cancer, lower blood pressure naturally, and protect your skin from aging. Flaxseed can boost the body’s natural detoxification process by helping to improve blood health. Flaxseeds are also a good source of fiber which can help the body get rid of waste products quicker and easier from your colon. You should always grind flaxseeds before use and avoid buying ground flaxseeds. This will help you get the best health benefits from these natural blood cleansers. Cat’s claw can help with blood detox by increasing the amount of urine and toxins that are eliminated by the body. Ginger belongs to the same family as turmeric (Zingiberaceae family) and contains some similar compounds. The health benefits and blood cleansing properties of ginger come mainly from gingerols which have antioxidant and detoxifying properties effect in the body. Consuming lemon water is another great way to cleanse your blood and detoxify your liver. Lemons also contain large amount of toxin-eradicating vitamin C. Vitamin C is a powerful antioxidant which is needed to manufacture glutathione.32 Glutathione is one of the most powerful antioxidants in your body. It is found in every cell in the body, and it protects the cell’s engine, called the mitochondria, from bacteria and viruses as well as toxins. Low levels of glutathione leave you susceptible to oxidative stress, free radicals, infections and cancer. Then your liver gets overloaded and damaged, making it unable to do its job of detoxification. To keep your blood healthy and free of toxins, it’s essential that you drink plenty of water. Water helps to keep your blood from becoming too thick and it helps toxins to get flushed out easier. There are numerous benefits to your general health by drinking enough water. If you are interested in detoxifying your body, you can find more useful information in my eBook The Detox Guide. This guide will teach you how to use detox to cleanse and energize your body naturally and safely. URMC. What are red blood cells? NCBI. How does the liver work? Basic Clin Pharmacol Toxicol. 2012 May;110(5):476-81. J Nutr Metab. 2015; 2015: 760689. Pharmacol Res. 2007 Mar; 55(3): 224–236. Nutrients. 2015 Apr; 7(4): 2801–2822. Mol Cell Biochem. 2009 Nov;331(1-2):135-43. Behav Brain Funct. 2015; 12: 6. World J Gastroenterol. 2010 Jun 7; 16(21): 2657–2663. Herbal Medicine. Turmeric, the golden spice. Eur J Gastroenterol Hepatol. 2008 May;20(5):436-40. Curr Cardiol Rev. 2010 Nov; 6(4): 274–279. Nitric Oxide. 2014 Nov 15;42:44-53. Thanks for sharing this very informative means to heal if not to cure very common illness. This information is very informative thanks I will try juicing for health, useing a nutibullet. thanks so much for this important information. Should flax seed be ground before use? Great article. Thank you. Yes, the seeds are quite hard with a tough exterior which makes them difficult for the intestinal enzymes to break down. If you eat the seeds without grinding, they’ll pass through the intestines and out of the body without giving you their benefits. Thanks for those tip caus I had never known that. Thanks for the valuable informations I ever get from. I have completed my Naturopathy (Nature cure) studies and going to complete the internship very soon. In Nature cure…food n diet plays an important role and these informations…provided by you are very much useful for all of us. Very informative, thanks for sharing…knowledge is power. As a licensed herbalist, I’ve found chaparral to be an excellent blood cleanser and would it put it on this list along with some other Chinese herbs. Hi Darren is chaparral plant available in Philippines specially in our manila seedling bank? Where I can buy? Would this be helpful for people who already have sepsis? Hi Laura, sepsis is a very serious condition, potentially life-threatening. Such serious cases require early intensive medical treatment. I have a pimple break out now..i am 48 years old..is it because of my menopausal stage?..can u recommend herbal remedies for blood cleansing? Continue to consume the foods/herbs mentioned in the article. I consume almost all of the items on this list on a daily basis. I LOVE garlic. I eat raw >/= four garlic cloves at least 3 times, weekly. I also eat half an avocado, daily. Make sure to look at the avocado stem (naval) to pick a good one. The stem should have a slight yellow hue and the fruit should be firm on the outside, with little bruising/blemishes. If I have to take a test that can detect toxins from 6 months ago, how long should I continue consuming these items. Hi Arianna, I’m not sure what exactly were the toxins you were exposed to and to what extent, so I cannot give specific advice. The aim of the article is to generally encourage people to add these foods to their nutrition on a more regular basis and as part of consuming healthy diet that helps to cleanse the blood. We are all exposed to certain amounts of toxins from the environment and what we consume, so consuming these foods is not just a “one-time” process, but should be on a regular basis. The article said blood renews after 4-5 months so that suggests if you started consuming these foods now, your blood would be clean in 4-5 months. Hi Joann, I’m not a doctor hence I cannot provide an advice on specific cases. The information in this article is for maintaining a general health and well-being, and all the foods mentioned in the article are good options for blood cleansing. I’m not sure what is the level of toxins you have in your body and whether it causes you other symptoms that require professional medical advice, but unfortunately this is beyond my abilities and knowledge. Have you tried the distilled water therapy? Just to chime in, if you suspect or found yourself in poor health, it always helps to take in, preferably food than supplement or herbs, which assist in digestion (body primary elimination system), food which are good for the liver (body detox factory/cleanse the blood), food good for the kidney (secondary elimination of water based toxins) and well as food great for heart (increased circulation), skin (also a detox organ just not as effective as bowel or number 2) & brain (for sense of well-being). Clean up your eating habit and see yourself feeling better.